C.1 - The label for each hazardous chemical shall include the product identifier used on the safety data sheet. C.1.1 The labels on shipped containers shall also include the name, address, and telephone number of the chemical manufacturer, importer, or responsible party. 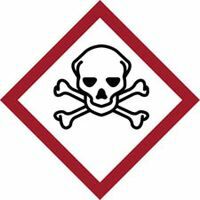 C.2 - The label for each hazardous chemical that is classified shall include the signal word, hazard statement(s), pictogram(s), and precautionary statement(s) specified in C.4 for each hazard class and associated hazard category, except as provided for in C.2.1 through C.2.4. 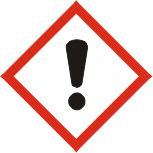 If the health hazard pictogram is included for respiratory sensitization, the exclamation mark pictogram shall not appear where it is used for skin sensitization or for skin or eye irritation. The text of all applicable hazard statements shall appear on the label, except as otherwise specified. The information in italics shall be included as part of the hazard statement as provided. For example: "causes damage to organs (state all organs affected) through prolonged or repeated exposure (state route of exposure if no other routes of exposure cause the hazard)". Hazard statements may be combined where appropriate to reduce the information on the label and improve readability, as long as all of the hazards are conveyed as required. If the chemical manufacturer, importer, or responsible party can demonstrate that all or part of the hazard statement is inappropriate to a specific substance or mixture, the corresponding statement may be omitted from the label. Pictograms shall be in the shape of a square set at a point and shall include a black hazard symbol on a white background with a red frame sufficiently wide to be clearly visible. A square red frame set at a point without a hazard symbol is not a pictogram and is not permitted on the label. C.2.3.2 One of eight standard hazard symbols shall be used in each pictogram. The eight hazard symbols are depicted in Figure C.1. A pictogram using the exclamation mark symbol is presented in Figure C.2, for the purpose of illustration. C.2.3.3 Where a pictogram required by the Department of Transportation under Title 49 of the Code of Federal Regulations appears on a shipped container, the pictogram specified in C.4 for the same hazard shall not appear. There are four types of precautionary statements presented, "prevention," "response," "storage," and "disposal." The core part of the precautionary statement is presented in bold print. This is the text, except as otherwise specified, that shall appear on the label. Where additional information is required, it is indicated in plain text. When a backslash or diagonal mark ( / ) appears in the precautionary statement text, it indicates that a choice has to be made between the separated phrases. In such cases, the chemical manufacturer, importer, or responsible party can choose the most appropriate phrase(s). For example, "Wear protective gloves/protective clothing/eye protection/face protection" could read "wear eye protection". When three full stops (…) appear in the precautionary statement text, they indicate that all applicable conditions are not listed. For example, in "Use explosion-proof electrical/ventilating/lighting/.../equipment", the use of "..." indicates that other equipment may need to be specified. In such cases, the chemical manufacturer, importer, or responsible party can choose the other conditions to be specified. When text in italics is used in a precautionary statement, this indicates specific conditions applying to the use or allocation of the precautionary statement. For example, "Use explosion-proof electrical/ventilating/lighting/.../equipment" is only required for flammable solids "if dust clouds can occur". Text in italics is intended to be an explanatory, conditional note and is not intended to appear on the label. Where square brackets ( [ ] ) appear around text in a precautionary statement, this indicates that the text in square brackets is not appropriate in every case and should be used only in certain circumstances. In these cases, conditions for use explaining when the text should be used are provided. For example, one precautionary statement states: "[In case of inadequate ventilation] wear respiratory protection." This statement is given with the condition for use "– text in square brackets may be used if additional information is provided with the chemical at the point of use that explains what type of ventilation would be adequate for safe use". This means that, if additional information is provided with the chemical explaining what type of ventilation would be adequate for safe use, the text in square brackets should be used and the statement would read: "In case of inadequate ventilation wear respiratory protection." However, if the chemical is supplied without such ventilation information, the text in square brackets should not be used, and the precautionary statement should read: "Wear respiratory protection." Precautionary statements may be combined or consolidated to save label space and improve readability. For example, "Keep away from heat, sparks and open flame," "Store in a well-ventilated place" and "Keep cool" can be combined to read "Keep away from heat, sparks and open flame and store in a cool, well-ventilated place." In most cases, the precautionary statements are independent (e.g., the phrases for explosive hazards do not modify those related to certain health hazards, and products that are classified for both hazard classes shall bear appropriate precautionary statements for both). Where a chemical is classified for a number of hazards, and the precautionary statements are similar, the most stringent shall be included on the label (this will be applicable mainly to preventive measures). An order of precedence may be imposed by the chemical manufacturer, importer or responsible party in situations where phrases concern "Response." Rapid action may be crucial. For example, if a chemical is carcinogenic and acutely toxic, rapid action may be crucial, and first aid measures for acute toxicity will take precedence over those for long-term effects. In addition, medical attention to delayed health effects may be required in cases of incidental exposure, even if not associated with immediate symptoms of intoxication. If the chemical manufacturer, importer, or responsible party can demonstrate that a precautionary statement is inappropriate to a specific substance or mixture, the precautionary statement may be omitted from the label. C.3.1 To ensure that non-standardized information does not lead to unnecessarily wide variation or undermine the required information, supplementary information on the label is limited to when it provides further detail and does not contradict or cast doubt on the validity of the standardized hazard information. C.3.2 Where the chemical manufacturer, importer, or distributor chooses to add supplementary information on the label, the placement of supplemental information shall not impede identification of information required by this section. C.3.3 Where an ingredient with unknown acute toxicity is used in a mixture at a concentration ≥ 1%, and the mixture is not classified based on testing of the mixture as a whole, a statement that X% of the mixture consists of ingredient(s) of unknown acute toxicity is required on the label. … Chemical manufacturer, importer, or distributor to specify parts of the body to be washed after handling. … Chemical manufacturer, importer,or distributor to specify the appropriate source of emergency medical advice. … Reference to supplemental first aid instruction. - if immediate administration of antidote is required. Wash … thoroughly after handling. … Chemical manufacturer, importer, or distributor to specify the appropriate source of emergency medical advice. ... Reference to supplemental first aid instruction. If swallowed: Call a poison center/doctor/…/ if you feel unwell. … Chemical manufacturer, importer, or distributor may specify a cleansing agent if appropriate, or may recommend an alternative agent in exceptional cases if water is clearly inappropriate. - if immediate measures such as specific cleansing agent is advised. Call a poison center/doctor/…/if you feel unwell. - if measures such as specific cleansing agent is advised. Do not breathe dust/fume/gas/mist/ vapors/spray. Chemical manufacturer, importer, or distributor to specify applicable conditions. [In case of inadequate ventilation] wear respiratory protection. Chemical manufacturer, importer, or distributor to specify equipment. - Text in square brackets may be used if additional information is provided with the chemical at the point of use that explains what type of ventilation would be adequate for safe use. - if product is volatile as to generate hazardous atmosphere. - if immediate specific measures are required. - if product is volatile so as to generate hazardous atmosphere. … in accordance with local/regional/national/international regulations (to be specified). Use only outdoors or in a well-ventilated area. If inhaled: Remove person to fresh air and keep comfortable for breathing. - if inhalable particles of dusts or mists may occur during use. …Chemical manufacturer, importer, or distributor to specify parts of the body to be washed after handling. Chemical manufacturer, importer, or distributor to specify type of equipment. If swallowed: Rinse mouth. Do NOT induce vomiting. - Manufacturer, importer, or distributor may specify a cleansing agent if appropriate. Manufacturer, importer, or distributor may specify a cleansing agent if appropriate. Chemical manufacturer, importer, or distributor to specify type of equipment. If in eyes: Rinse cautiously with water for several minutes. Remove contact lenses, if present and easy to do. Continue rinsing. … Chemical manufacturer, importer, or distributor to specify parts of the body to be washed after handling. If in eyes: Rinse cautiously with water for several minutes. Remove contact lenses, if present and easy to do. Continue rinsing. If inhaled: If breathing is difficult, remove person to fresh air and keep comfortable for breathing. Chemical manufacturer, importer, or distributor to specify type of equipment. Chemical manufacturer, importer, or distributor to specify type of equipment, as required. Wear protective gloves/protective clothingprotective gloves/protective clothing/eye protection/face protection. Note: If a Category 2 carcinogen ingredient is present in the mixture at a concentration between 0.1% and 1%, information is required on the SDS for a product; however, a label warning is optional. If a Category 2 carcinogen ingredient is present in the mixture at a concentration of > 1%, both an SDS and a label is required and the information must be included on each. Avoid contact during pregnancy/while nursing. - if immediate measures are required. … Chemical manufacturer, importer, or distributor to specify the appropriate source of emergency medical advice. Store in a well-ventilated place. Keep container tightly closed. Wear personal protective equipment/face protection. Explosion risk in case of fire. Do NOT fight fire when fire reaches explosives. …in accordance with local/regional/ national/international regulations (to be specified). Chemical manufacturer, importer, or distributor to specify applicable ignition source(s). … Chemical manufacturer, importer, or distributor to specify appropriate material. - if drying out increases explosion hazard, except as needed for manufacturing or operating processes (e.g., nitrocellulose). - if the explosive is electrostatically sensitive. Do not subject to grinding/shock/…/friction. …Chemical manufacturer, importer, or distributor to specify applicable rough handling. Chemical manufacturer, importer, or distributor to specify type of equipment. In case of fire: evacuate area. international regulations (to be specified). Note: Unpackaged explosives or explosives repacked in packagings other than the original or similar packaging shall have the label elements assigned to Division 1.1 unless the hazard is shown to correspond to one of the hazard categories in Appendix B.1, in which case the corresponding symbol, signal word and/or the hazard statement shall be assigned. Chemical manufacturer, importer, or distributor to specify applicable rough handling. - except if explosives are 1.4S ammunition and components thereof. - if explosives are 1.4S ammunition and components thereof. In case of fire: Evacuate area. … in accordance with local/regional/ national/international regulations (to be specified). Do not extinguish, unless leak can be stopped safely. Eliminate all ignition sources if safe to do so. Chemical manufacturer, importer, or distributor to specify applicable ignition sources(s). Leaking gas fire: Do not extinguish, unless leak can be stopped safely. Pressurized container: Do not pierce or burn, even after use. Protect from sunlight. Do not expose to temperatures exceeding 50 ºC/122 ºF. Keep/Store away from clothing/…/combustible materials. …Chemical manufacturer, importer, or distributor to specify other incompatible materials. Keep reduction valves/valves and fittings free from oil and grease. In case of fire: Stop leak if safe to do so. Wear cold insulating gloves/face shield/eye protection. Thaw frosted parts with lukewarm water. Do not rub affected area. Keep away from heat/sparks/open flames/hot surfaces.– No smoking. - if electrostatically sensitive material is for reloading. ... Chemical manufacturer, importer, or distributor to specify other equipment. In case of fire: Use ... to extinguish. ... Chemical manufacturer, importer, or distributor to specify appropriate media. - if water increases risk. … in accordance with local/regional/national/ international regulations (to be specified). Keep away from flames and hot surfaces. – No smoking. in accordance with local/regional/ national/international regulations (to be specified). Use explosion-proof electrical/ventilating/ lighting/... /equipment. ... Chemical manufacturer, importer, or distributor to specify other incompatible materials. Store at temperatures not exceeding …°C/…°F. ... Chemical manufacturer, importer, or distributor to specify temperature. Keep/Store away from clothing/.../combustible materials. …in accordance with local/regional/national/international regulations (to be specified). ...Chemical manufacturer, importer, or distributor to specify temperature. Do not allow contact with air. ... Chemical manufacturer, importer, or distributor to specify appropriate liquid or inert gas. Brush off loose particles from skin. Immerse in cool water/wrap in wet bandages. …Chemical manufacturer, importer, or distributor to specify appropriate liquid or inert gas. Keep cool. Protect from sunlight. Maintain air gap between stacks/pallets. Store bulk masses greater than … kg/…lbs at temperatures not exceeding …°C/…°F. ... Chemical manufacturer, importer, or distributor to specify mass and temperature. Do not allow contact with water. Brush off loose particles from skin and immerse in cool water/wrap in wet bandages. …in accordance with local/regional/national/ international regulations (to be specified). 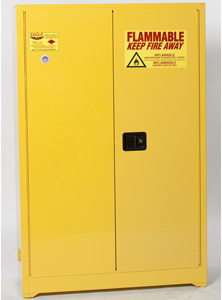 Keep/Store away from clothing and other combustible materials. Wear protective gloves /eye protection/face protection. Keep away from clothing and other combustible materials. Keep/Store away from clothing/…/ combustible materials. … Chemical manufacturer, importer, or distributor to specify incompatible materials. Keep away from heat/sparks/open flames/hot surfaces.- No smoking. ... Chemical manufacturer, importer, or distributor to specify incompatible materials. Store at temperatures not exceeding …°C/…°F. Keep cool. Keep /Store away from clothing/.../combustible materials. Chemical manufacturer, importer, or distributor to specify type of equipment. Store at temperatures not exceeding …°C/…°F. Keep cool. Chemical manufacturer, importer, or distributor to specify temperature. Keep only in original container. Absorb spillage to prevent material damage. Store in corrosive resistant/... container with a resistant inner liner. ... Chemical manufacturer, importer, or distributor to specify other compatible materials. 1 Except no pictogram is required for explosives that are 1.4S small arms ammunition and components thereof. Labels for 1.4S small arms ammunition and components shall include appropriate precautionary statements. 2 The chemical manufacturer or importer shall label chemicals that are shipped in dust form, and present a combustible dust hazard in that form when used downstream, under paragraph (f)(1); 2) the chemical manufacturer or importer shipping chemicals that are in a form that is not yet a dust must provide a label to customers under paragraph (f)(4) if, under normal conditions of use, the chemicals are processed in a downstream workplace in such a way that they present a combustible dust hazard; and 3) the employer shall follow the workplace labeling requirements under paragraph (f)(6) where combustible dust hazards are present. Entry last updated: Tuesday, February 26, 2019. This hypermarked and content-enhanced page is copyright 2001-2019 by ILPI, all rights reserved. Unauthorized duplication or posting on other web sites is expressly prohibited. For questions, comments and concerns, please contact us at our MSDS email address. The official, public domain, OSHA version of this document is available at https://www.osha.gov/pls/oshaweb/owadisp.show_document?p_table=standards&p_id=10102.